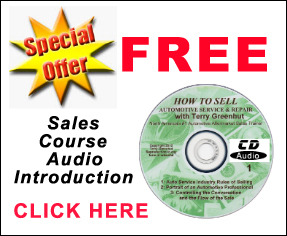 This automotive service and repair sales training course presents a clearly defined and proven, step by step method of getting customers to your shop and selling to them for the right price once they get there. Then it teaches you how to keep those customers and build a long lasting referral business that will keep paying you dividends forever. 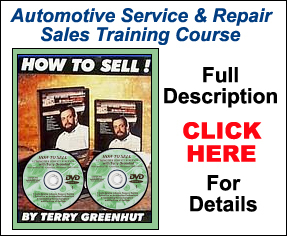 Terry Greenhut has been showing people how to make good money in the auto repair and transmission business since 1980 when he started writing shop management bulletins for the various industry Trade Association publications. The sales course Terry developed and has been teaching since 1984 has been enjoyed by over 18,000 of your fellow shop owners and managers. It’s geared to teach anyone in the business how to sell to their retail, wholesale, and fleet customers at the best possible profit. Why give your work away if you don’t have to? Knowing the right words to say can make the difference between working late into the night for peanuts and going home at a decent hour with money in your pocket. Most owners and managers think that people won’t pay good money to get their cars fixed. The truth is that they don’t want to pay any money to get them fixed. But they will spend top dollar if you know how to ask for it and have the objection handling skills to back it up. This sales training program not only teaches you how to get top dollar for your work, it also shows you how to keep your customers happy while you’re doing it. Before Terry began teaching this sales training course, only franchisees had access to any sales training in the auto repair or transmission industry. Now you can learn to compete with them on their level. If you’re tired of watching the shop down the street get good money while you get less for doing the same job, maybe it’s time for you to find out what they already know; how to sell! No, it’s not automatic. None of us were born knowing how to sell properly. It is a skill that is developed over a period of time and needs to be learned just like any other. 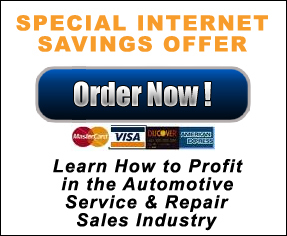 The course is designed to teach anyone and everyone in an auto repair or transmission shop to deal with customers effectively. It will even show technicians, who don’t normally talk to customers, how to make telephone price shoppers want to bring their cars in for diagnosis and repair. Many of you read Terry’s articles in Transmission Digest, Undercar Digest, the ASC California Independent and in Motor Magazine’s Emission Repair Monthly. Now you can have him on your car stereo or right there on your living room TV. With his new audio and video packages Terry is now able to bring his entire two day sales training seminar directly to you. Just think. No more traveling and staying in a strange hotel (and some of them have been very strange over the years). No more giving up an entire weekend to get the training you need. And no more being stuck in a classroom for two solid days when you could be out doing something really important like fishing or playing golf. There is no longer any need to send employees to a live seminar. Just hand them a set of tapes, DVDs, or CDs and you’ve provided the best training available, in the most cost effective manner! These recordings were done at a live seminar complete with an audience of your peers asking just the right questions. Both the audio and the video packages have the same sound track. They contain nine hours of detailed, practical instruction and include all twenty three lessons. They both come with a “fill in the blanks” workbook which makes a great teaching aid. The video package includes over 350 computer graphics and special effects that keep it exciting while at the same time placing the proper amount of emphasis on the truly important points. 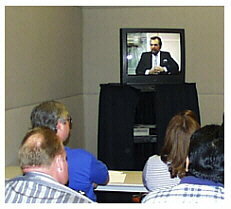 Many shop owners are ordering the videos and using them to run their own in house, sales training seminar. Once they see how the tapes help them, they call and order enough workbooks for the entire staff. Who needs sales training? Everybody who comes into any contact with customers. From the person who stands face to face with most of them, to the technician who picks up the occasional phone call, and everyone in between. Have you ever wanted to start an effective outside sales program? These DVDs, or CDs will show you how to send someone out who will actually bring you back new wholesale and fleet customers that want quality work at a fair price. You’ll learn what to say and when to say it’ what to offer and how to knock the competition right out of the box. Having trouble with that initial phone call when the customer asks how much? Most everybody does. That’s why one of the DVDs or CDs in the set is devoted strictly to teaching you how to get that customer to the shop. You’ll learn the words that will make them want to bring the car in for you to diagnose so you can offer them the best possible service. Then it won’t only be about price anymore. Some of you have spent many thousands of dollars going to management workshops and consultants who tell you to keep good statistics and watch the bottom line. The real deal is that if you don’t learn effective methods of getting your price consistently while raising your customer count, the only statistic you’ll be watching is your bottom line shrinking away to nothing!